A hearty and heartwarming classic recipe that will complement any dinner. Garlic and potatoes are roasted together, making the perfect succulent side dish. Serve next to juicy steaks or alongside grilled vegetables for a surprisingly easy dinner favorite. Wash the potatoes and cut into large bite-sized chunks, leaving the peels on. Combine potato pieces, minced garlic, and salt in a bowl until potatoes are evenly coated with olive oil. Place potatoes and garlic in a large roasting pan and bake, uncovered, for 30-40 minutes until crispy and cooked through. Back to the Potato Recipes home page. This recipe is real easy to make and very tasty, also everyone enjoyed. It took 40 min. Just like it said. Very Tasty, but the cooking time needs to be adjusted to the higher end. I cooked mine for 30 minutes and some of the chunks were not quite cooked all the way through. I also added a sprinkle of Italian seasoning and a small sprinkle of garlic salt right before cooking. This recipe is simple to make, and fun to eat. 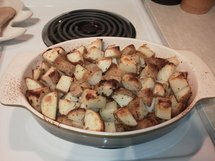 :) Although the cooking time is incorrect, becuase the potatoes need about 40 more minutes until they were soft. Other than that I loved this recipe and makes for a great dinner. Average rating of 4.00 stars based on 3 reviews. Summary: A hearty and heartwarming classic recipe that will complement any dinner. 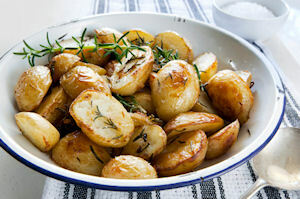 Garlic and potatoes are roasted together, making the perfect succulent side dish. Serve next to juicy steaks or alongside grilled vegetables for a surprisingly easy dinner favorite.